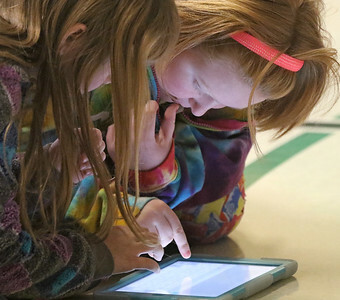 Matthew Apgar - mapgar@shawmedia.com Riley Schneider, left, and Piper Hall use an iPad to follow along with an online behavior workshop with Cary District 26 Instructional Technology Coordinator Jennifer Fisher at Briarwood Elementary School on Thursday, Feb. 11, 2016 in Cary. 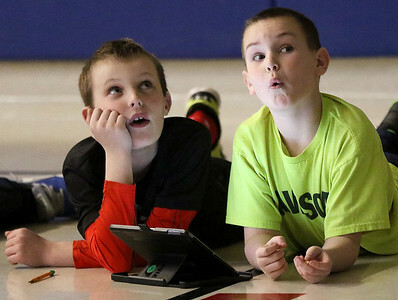 Matthew Apgar - mapgar@shawmedia.com Mason Duvall, left, and Jake Steele use an iPad to follow along with an online behavior workshop with Cary District 26 Instructional Technology Coordinator Jennifer Fisher at Briarwood Elementary School on Thursday, Feb. 11, 2016 in Cary. Matthew Apgar - mapgar@shawmedia.com Cary District 26 Instructional Technology Coordinator Jennifer Fisher gives an online behavior workshop to students at Briarwood Elementary School on Thursday, Feb. 11, 2016 in Cary. Riley Schneider, left, and Piper Hall use an iPad to follow along with an online behavior workshop with Cary District 26 Instructional Technology Coordinator Jennifer Fisher at Briarwood Elementary School on Thursday, Feb. 11, 2016 in Cary.